Periodontal disease (aka gum disease) is a leading cause of tooth loss among adults. We screen all adult patients for periodontal disease prior to a cleaning. If disease is detected, we can address and treat the condition promptly and appropriately to help prevent tooth loss. Periodontal disease is an infection that leads to the inflammation and destruction of the supporting structures of the teeth: the gums and the surrounding bone. The bacteria that live in the plaque and tartar that accumulates on the teeth and under the gum-line causes this infection. If left untreated, periodontal disease can lead to tooth loss. In addition to tooth loss, periodontal disease can have an effect on your overall health as recent studies have shown links to conditions such as: heart disease, stroke, respiratory diseases, osteoporosis, diabetes, and pregnancy complications such as low birth weight. Periodontal disease can range in severity from the mildest stage called gingivitis to periodontitis. Gingivitis means inflammation or infection of the gums. In this stage of periodontal disease, the disease process has not involved the bone surrounding the teeth. The gums usually appear red or puffy instead of pink and firm, and the gum tissue also is more susceptible to bleeding when brushed or flossed. Gingivitis is reversible but requires professional dental cleanings on a regular basis and better brushing and flossing at home. If gingivitis is ignored, it can evolve into periodontitis. Periodontitis means inflammation or infection of both gums and bone that support the teeth. Periodontitis can range in severity to mild to severe. The gums will also usually appear red and puffy and bleed easily in the stage, but the bone is also involved. Usually periodontitis does not cause pain until more severe stages. Because periodontitis can destroy bone over time and lead to tooth loss, it is important to treat periodontal disease as early as possible. The screening process involves evaluating dental x-rays that check the level of bone around the teeth as well as examining the appearance of your gums. The gum tissue around each tooth will also be measured. 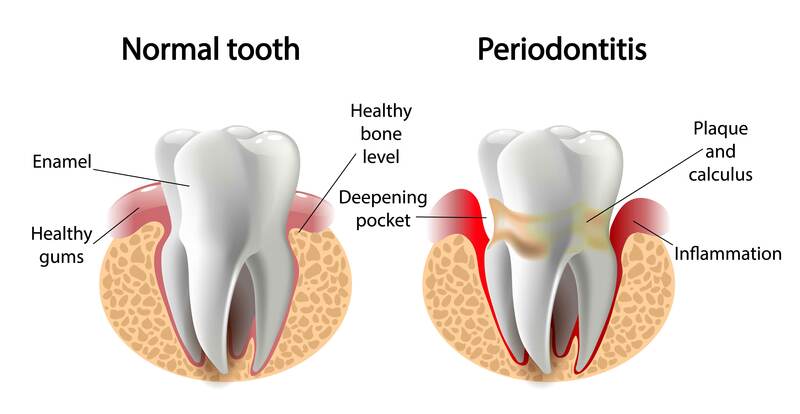 Each tooth has a space between the gum and the bone called a periodontal pocket. A healthy pocket’s depth is usually 1-3 millimeters(mm), higher measurements (above 4mm) is an indication of periodontal disease. In addition to measuring the gum tissue, we also look for gums that are bleeding. Scaling and root planing is a non-surgical procedure that is used to treat periodontal disease. It involves numbing the affected area and using hand or ultrasonic instruments (scalers) to remove plaque, tartar and bacteria from the base of the periodontal pocket. After this procedure, it is important to thoroughly brush and floss twice daily at home. The gum tissue will be re-evaluated in about one month from completion of the procedure. The goal of this procedure is to stop the progression of the disease and heal the periodontal pocket to a more cleansable depth, therefore preventing further bone loss around the teeth. With good home care and more frequent professional dental visits, we can prevent the disease from relapsing. If significant improvement is not seen with this procedure, a referral may be given to see a gum specialist, or periodontist. This is a specialized cleaning that is recommended for all patients that have been treated for periodontal disease. It is more in-depth that a basic dental cleaning and involves evaluating and maintaining any areas that have been treated in the past for periodontal disease. A Periodontal Maintenance cleaning is typically recommended every 3 to 4 months. By applying this treatment, we can help prevent periodontal disease from relapsing. Patients with advanced periodontal disease or patients that do not have significant improvement with scaling and root planing may need to be referred to a periodontist (a gum specialist) for more advanced therapies. We have partnered with several very experienced periodontists in the area to help coordinate your care.